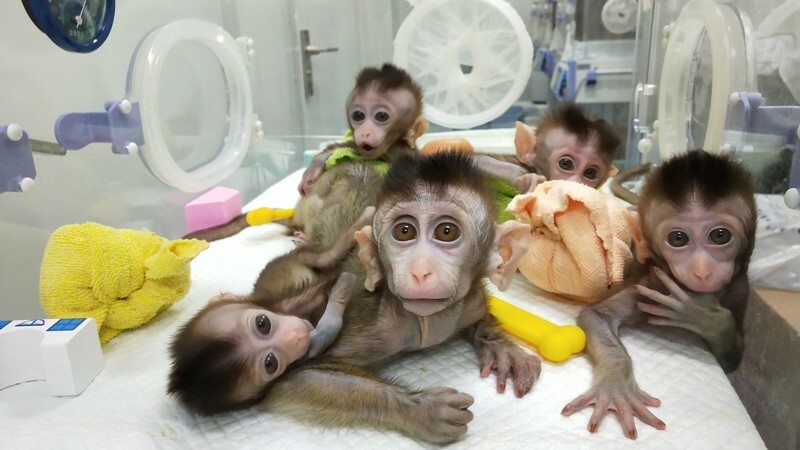 An interesting article from Nature discusses how scientists from the Institute of Neuroscience in Shanghai genetically modified and cloned monkeys. The scientists disabled a specific gene of a macaque monkey that was responsible in regulate their sleep-wake cycle. After they did the genetic-editing they then cloned the edited monkey and created five other monkeys with nearly identical genes. The ability to create animal specimens with specific genetic disorders give scientists the opportunity to work on large groups of animals suffering from the same genetic disorder. It was said in the article that using monkeys is quite inefficient and expensive. It took 325 embryos, 65 surrogate mothers, and around $500,000 to create these five genetically cloned monkeys. While, I believe the genetic research that could be done on these animals would be insanely beneficial to modern science and medicine, I don't know if I agree with it ethically. Primates especially are very intelligent and social animals and it has been shown that they suffer greatly not only physically but also emotionally and psychologically when used for medical experimentation.